Outfielder Carlos Tocci was signed by the Phillies for a reported signing bonus of $759,000 in the summer of 2011 on his 16th birthday. Since that time, many have raved about the teen's talent and he's done his best to live up to the hype. A native of Maracay, VZ, Tocci participated in the Florida Instructional League after he signed his first professional contract, but made his official minor league debut in 2012 as a member of the Gulf Coast League Phillies. His ability to compete with older players is definitely something that has Tocci standing out in the eyes of coaches, scouts and fans alike. In 2012, the righty batting "Toch" posted a .278 average with two doubles and nine RBI in 38 contests in the GCL, with all but one of his games played before his 17th birthday. He described the competition there as easy and the pitchers as predictable. The following year, Tocci found his opposition to be improved and tougher to handle. 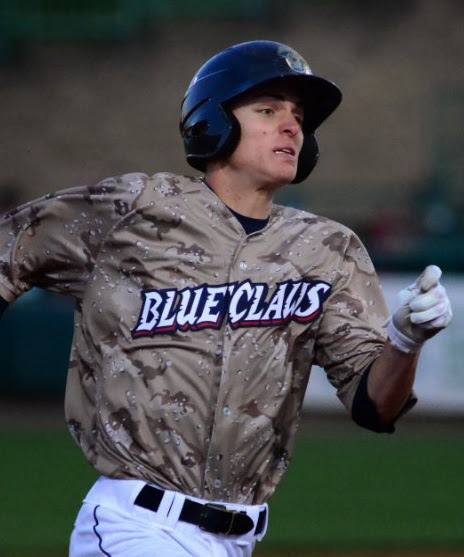 He continued to impress as he made the opening day roster for the Class A Lakewood BlueClaws and stayed on their roster for the entire season, but his statistics weren't great. Playing north of Florida for the first time in his life, Tocci struggled in the early going, posting a .192 average in 22 games in the northeast's cool April weather. As the spring season took shape, Tocci's batting average would see a nice boost along with the temperatures, as he hit .269 in 27 May games. The summer heat didn't keep his production going, however, as overall in 118 games for the 'Claws, Tocci put together an unimpressive .209/.261/.249 offensive line. Despite those troubling numbers, the organization was still pleased with his efforts, as he never appeared overwhelmed as the youngest player in the league. Tocci has drawn attention for possessing great instincts at the plate. He has quick hands, shows a solid ability to get the barrel of his bat to the ball and can hit to all fields. The six-foot-two 170-pounder has developed a reputation for being too skinny and needing to add muscle. Coaches and team execs regularly cite the promise that Tocci has and speak of looking forward to when he develops increased upper body strength. He already has gap power, but hasn't forced any balls to leave the yard in two seasons in the minors. Tocci is often praised for his maturity and focus on making necessary adjustments. In an interview with me last summer, Tocci, who grew up admiring big league slugger Miguel Cabrera, asserted that another highly regarded Phillies prospect, shortstop Roman Quinn, helped him progress last year. The two would regularly discuss opposing pitchers and set up an offensive game plan prior to contests while they were teammates with Lakewood. On defense, Tocci, who turned 18 in late August, has excellent range and glides to the ball, easily covering a lot of ground to track down fly balls. With 10 outfield assists in 2013, he's got a very good arm that can keep brazen runners from taking extra bags. Tocci has been strictly a center fielder during his time in the minors, playing just one GCL game in left field. On the bases, Tocci is very quick and will be a stolen base threat as he moves upward in the developmental ranks, despite not being very successful (six steals in 13 chances) in stolen base attempts last year. He's capable of taking advantage of weak-armed outfielders and grabbing extra bases when opportunities arise. It seems suitable that Tocci would repeat a season in the South Atlantic League with Lakewood this year. The additional exposure to that level would be the best thing for him at this stage.